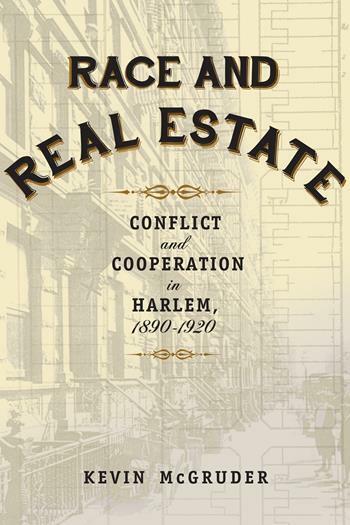 Legal History Blog: McGruder, "Race and Real Estate: Conflict and Cooperation in Harlem, 1890-1920"
McGruder, "Race and Real Estate: Conflict and Cooperation in Harlem, 1890-1920"
Through the lens of real estate transactions from 1890 to 1920, Kevin McGruder offers an innovative perspective on Harlem's history and reveals the complex interactions between whites and African Americans at a critical time of migration and development. During these decades Harlem saw a dramatic increase in its African American population, and although most histories speak only of the white residents who met these newcomers with hostility, this book uncovers a range of reactions. Although some white Harlem residents used racially restrictive real estate practices to inhibit the influx of African Americans into the neighborhood, others believed African Americans had a right to settle in a place they could afford and helped facilitate sales. These years saw Harlem change not into a "ghetto," as many histories portray, but into a community that became a symbol of the possibilities and challenges black populations faced across the nation. This book also introduces alternative reasons behind African Americans' migration to Harlem, showing that they came not to escape poverty but to establish a lasting community. Owning real estate was an essential part of this plan, along with building churches, erecting youth-serving facilities, and gaining power in public office. In providing a fuller, more nuanced history of Harlem, McGruder adds greater depth in understanding its development and identity as both an African American and a biracial community. More information, including the TOC and an excerpt, is available here.